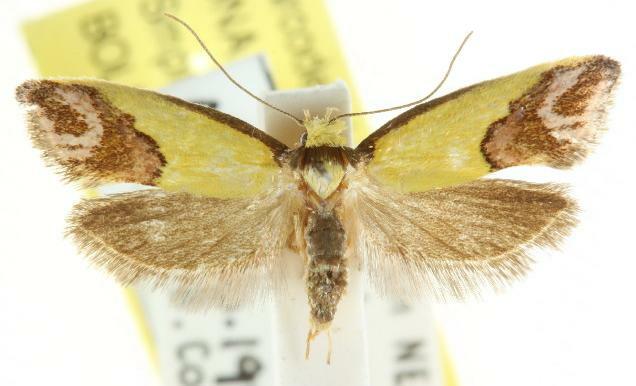 These adult moths have forewings which are yellow, each with a dark brown band at the base, a dark line along part of the costa, and a large brown area along the margin containing pale arcs. 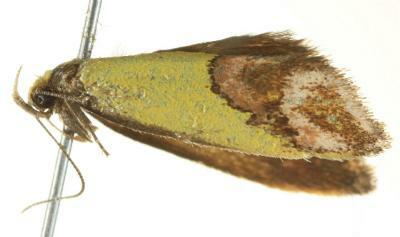 The hindwings are dark grey-brown, fading at the bases. The head is yellow, and the thorax mainly dark brown. The wingspan is about 2 cms. CSIRO Publishing, Melbourne 1994, p. 289. Series 1, Volume 9, Number 3 (1884), p. 764, 776-777, No. 321.